Another month - and another theme! It's currently winter in Australia so I've been on a mission to make our house as cosy as humanely possible. 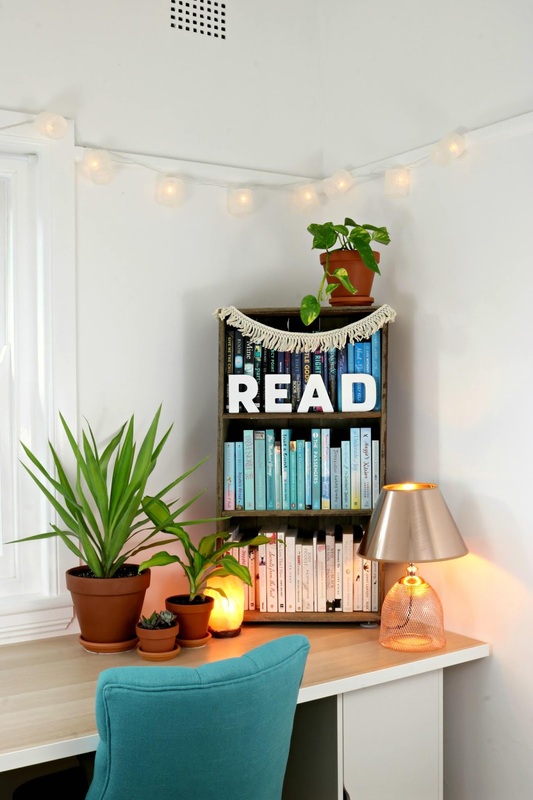 Borrowing some ideas from my Hygge Home Decor Theme Ideas and Inspiration post last month, this month I've created a boho inspired theme that was created around my new plant babies! 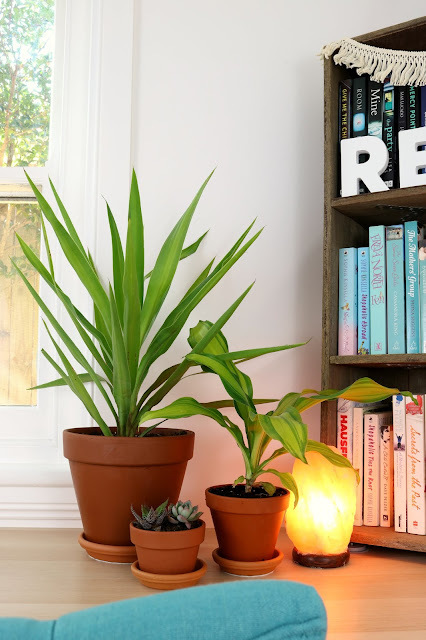 You see, I may have a black thumb (and bad luck with plants) but I've found some of the easiest to care for house plants that I want to share with you - as well as give you a little tour of this month's theme! 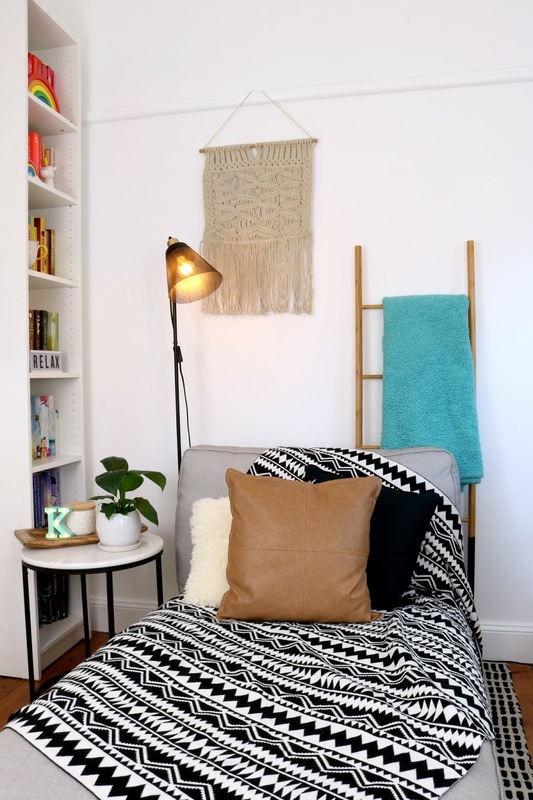 This month, when it came to choosing a new theme, I had three main things I wanted to tie into the space; my plant babies, my new teal office chairs and this incredible Aztec Throw Rug from Habitat 101. It's a bold choice - but it is seriously the cosiest, softest blanket you have ever felt - so I knew I wanted to make it a focal point. With the throw having such a bold pattern, I wanted to keep the rest of theme simple, with hints of teal/blue and black, white and brown/neutral tones. 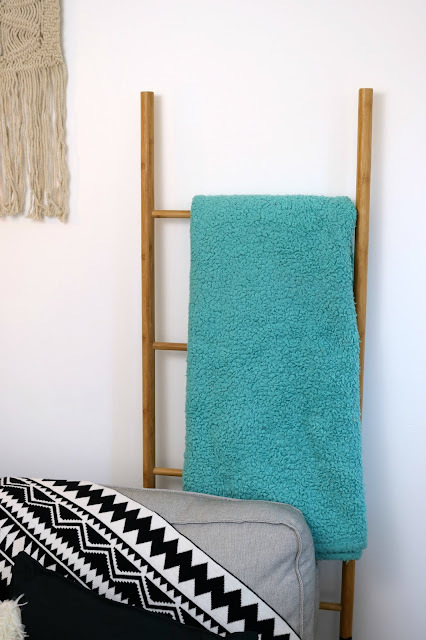 This bamboo ladder was the perfect way to store some of my excess blankets - whilst also adding height and a pop of colour with the teal throw. If you remember when we first renovated the room, this wall was the disaster wall. I still have nightmares about that wall so we are NOT hanging anything on it (I feel like the wall will just crumble and my soul will crumble along with it) - so the ladder leaning against the wall is a perfect alternative - and would be the perfect decor addition if you're renting too as you can use it for everything from blankets to hanging plants or picture frames. On the picture rail, I hung a macrame wall hanging I found in the nursery section of Kmart ($15) and on the side table, I added a wooden tray, K light, jar (which may or may not have chocolates inside) and my peace lily. But what those magazines fail to mention is that there are plants out there that are totally black thumb friendly. Peace Lily: It survives in pretty much any light - we have one on top of our refrigerator and one in my office. They're generally cheap to buy (I picked mine up for $9) and so easy to care for. Care Tip: Don't over water it. When you first put it in a pot, make sure it's well watered - but then wait to water it until it wilts. All of a sudden you'll notice the leaves have fallen and it's looking pretty sad - but fear not! Give it a good soak in your sink until the leaves pop back up again and it looks like it's come back to life, let it drain and then pop it back where it was. Yucca: A pretty hardy plant that can be kept inside or outside. If your house regularly drops below 12 degrees celsius (53 degrees farenheit) this isn't the plant for you - but otherwise you'll probably be able to keep it alive. You'll want to keep this one close to a window so it gets some natural light. Care Tip: Water it around every 10 days or whenever the soil is dry. You'll know it's time to water it when you stick your finger into the soil and it's dry below your knuckle. If your leaves start to turn yellow, it means you're giving it too much water - or if they start to look crunchy or dead looking, you probably need to give them more water! I take mine outside for a little time in the sun once a week. Happy Plant: If it's got happy in the name, it's got to be good... right?! The Happy Plant has similar care needs to the Peace Lily - it's happy in the shade and likes to dry out before it's watered. Care Tip: If your plant has dry or dead leaves, carefully pull them out. This stops the plant from putting too much energy into the dead leaves instead of focusing on the good ones! I also take my Happy Plant out with my yucca once a week for some sun - just not direct summer sunshine. Devil's Ivy: I promise you won't need to bargain with the devil to keep this plant alive. This is a fun plant to have because of the way it drops, making it perfect for on top of shelves or hanging from the ceiling. 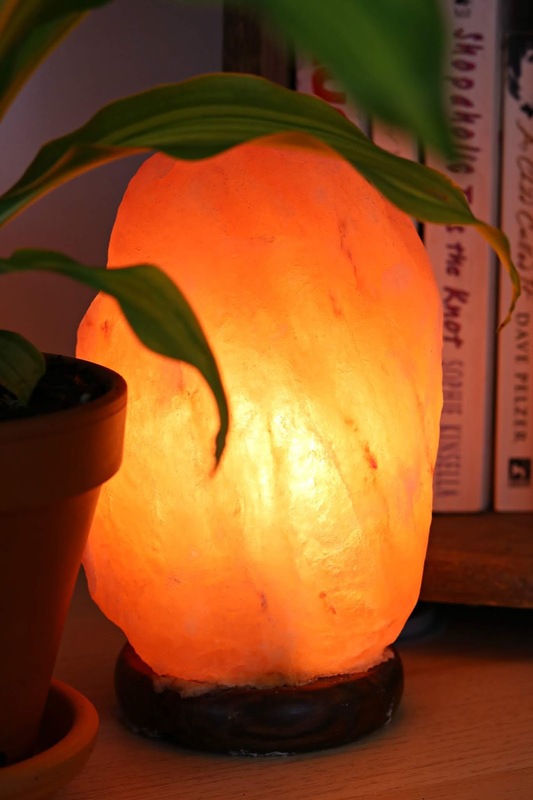 Care Tip: You can trim and shape your plant however you like - so if it starts growing in a direction that doesn't work, carefully snip that part off. Water your devil's ivy only when the soil is dry. For the peg board, I continued the black/white/wood/plant theme with some simple decor bits and pieces. 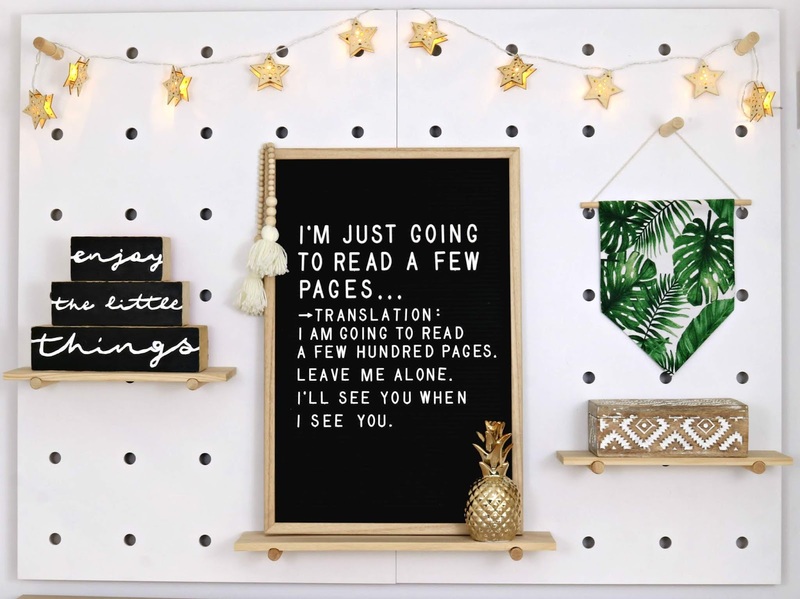 These Wooden Star Twinklers from Habitat 101 were too cute to pass up - and perfect for this theme! They're battery operated so the battery pack is simply tucked behind the peg board. To tie the twinklers onto the wooden poles, I use two little pieces of twine. Enjoy the Little Things Blocks: Handmade, instructions here. Palm Leaf Fabric Hanging: Handmade, no sew instructions here. On the other side of the room is my beloved DIY Recycled Wood Bookshelf. This month I continued the teal/blue accents with blue books, adding my plant babies, a salt lamp and this Copper Table Lamp from Brosa. See that touch of blue on the corner? They would be my new office chairs! It seems Trixie approves! 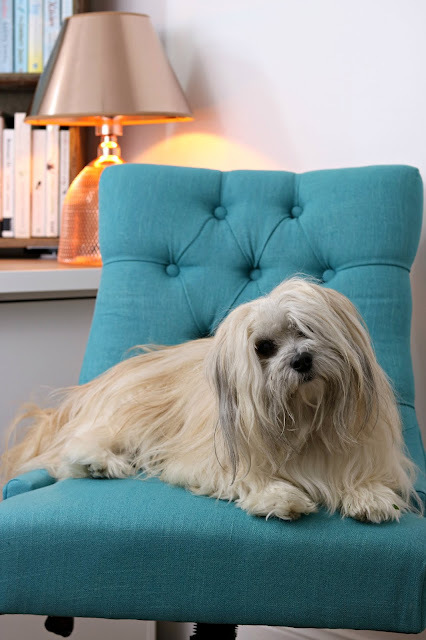 These are the Espen Office Chairs from Brosa in Petal Turqoise. I've been looking for the perfect office chairs since we first finished the room and these are definitely it. I may have had a little bit of buyers remorse when I realised the colour of the chairs kind of restricts how I can decorate the room - but I love the colour so much that I don't really care too much now! They currently have 13 colours to choose from though so you can perfectly match the chair to your space. And that's about it! Super cosy and I am loving the warm golden light on these cold winter days where the sunlight through my office window is pretty much nonexistant! 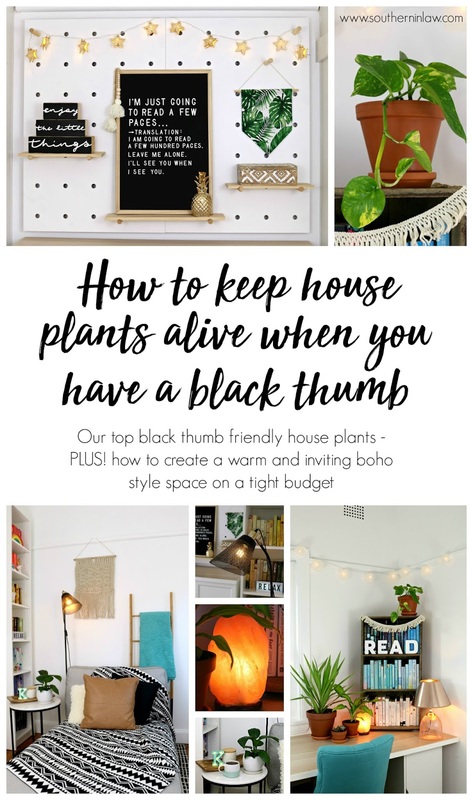 Do you have a black thumb? Or are you a plant goddess/god?